View, filter, and download a list of actions across your system in System Setup > Action log. With all of your team sharing data in one system, there’s going to be times that you need to know who did what. 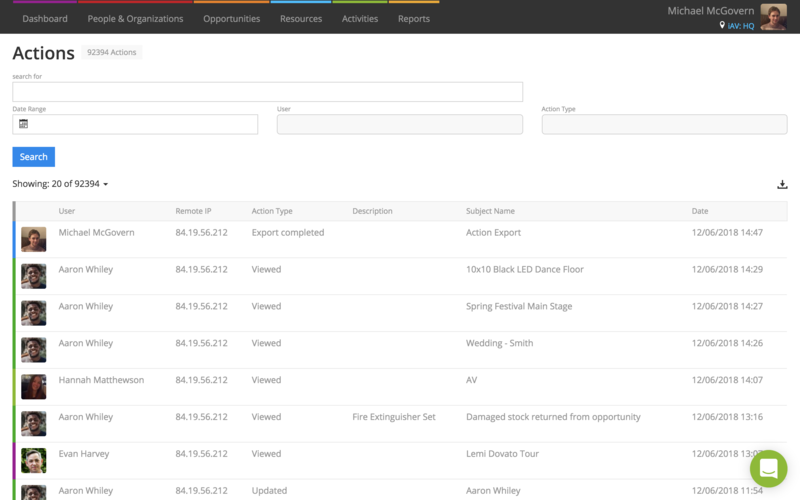 Use the Actions Log to get a list of actions taken across your system that you can search and download. What kind of actions are logged? Invoices posted to QuickBooks Online (QBO) or Xero. Head to System Setup > Actions Log to get started. Your initial view is all of the actions on your system, with the latest actions at the top. You’ll see the user account, IP address, action type, date, along with the associated record (subject name), and a description that includes additional information (e.g. the document or item name). Download your view to CSV spreadsheet by using the small download icon at the top-right. The downloaded spreadsheet includes a “Session ID” column. The session ID is unique to the logged in user account’s particular browser session. If colleagues share logins at your company, this is a good way of distinguishing between logged in devices. Whenever you visit a website, your internet browser passes along your user agent. This is some text that lists information about your web browser version and operating system. This is also included in the exported spreadsheet.